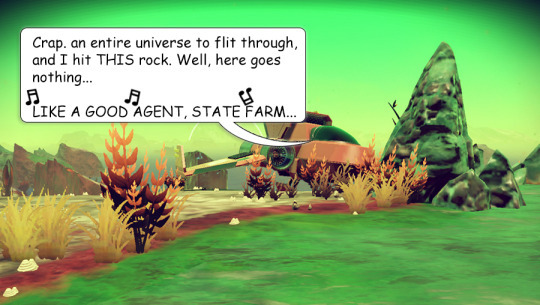 No Man's Sky is a science fiction adventure game. It will feature a procedurally generated open universe with players being free to explore the entirety of the large universe, upgrade their character's equipment, and purchase a variety of starships. There are no moderators for this game yet. If you are interested in moderating No Man's Sky please get in touch with us! So No Man's Sky is a lot of fun. I haven't had any major issues with the game luckily so it helps. I love the exploration aspect of the game including the languages you have to learn. I definitely plan on sinking more hours into the game. That looks really pretty, thanks for sharing! I finally got my warp drive fixed and fueled, and jumped systems. Hopped on down to a new and found a recipe to make my own warp coils, or whatever they're called, so now I can warp around the universe to my heart's content. I jumped again, new system, new planet, and found a new boat. Frisky sentinels swarmed me but I held them off as I mined what I needed to to fix my ride, then I got off the surface and into a space station… where I spent a million units on yet another boat. Now i'm just following the Atlas prompts until I can score an Atlas pass, 'cause I hate locked doors. And I've got plans to max out my mining tool and weaponize it to the teeth so if I happen across any more sentinels or hostile scrub-jumpers, I'll be ready. We'll see where it goes after that. Miss my lil' OG ship, though. See you on the dark side, kid. I fell to the hype and purchased No Mans Sky, Was super hyped to play whilst at work today. Got home installed quickly (only about 3gb on steam) got into game and wow was I left sitting silently in mediocrity. Firstly as you will read on steam with the "Mostly negative" reviews the game is technically broken; common & sometimes Huge FPS drops, a lot of texture / object pop in and many people suffer from crashing.. mine only crashes if I alt tab. Secondly its a port so the control scheme on a keyboard is strange.. you can get used to it but its odd and there are moments that are clearly meant for a controller and the field of view is kinda awful for someone sitting at a PC desk.. like your permanently zoomed in. And lastly & most importantly the game play.. Its Dull. it starts off cool.. full of mystery and the want to explore but after about an hour playing I found myself just flying very fast from planet to planet, then fly slightly slower from artefact to artefact, chat to a few locals, shoot some rocks for fuel.. rinse and repeat. It has a strange scenery distancing factor as well which ruins the exploration.. I cant quite put my finger on it but running at 4k with max graphics, it looks fairly decent however i never felt immersed in the world.. like i could stand on a cliff and soak in the scenery like you can in Skyrim, ARK or even final fantasy nothing made me go "Woooaaah!". And that's my Review of No mans sky.. A game i hoped was amazing but on the fence about, but for now will continue waiting for Star Citizen. My recommendation, Buy on steam for refund ability or buy on console. I reckon they will fix the technical & port issues and if it drops in price i will probably buy it again as it's not a bad game as such.. personally I think they should have made 300 planets by hand and not 18 Quintilian procedural generated planets. A planet made by hand allows the developers to make a Full interesting world with amazing sights, huge mountains and volcano's, barren grand canyon style plateau's, Cliffs overlooking vast oceans, ancient overgrown forests, endless deserts with massive sand dunes and small oasis settlements dotted about.. "imagination is the essence of discovery" and then they place relics at scenic Vista's to reward exploration. To be fair, that procedural immensity was the developer's vision, and on that they have delivered. Whether it's something people actually enjoy playing for long time will tell. I don't doubt that its an amazing accomplishment for such a small studio which has allowed them to create their dream of a vast universe but I just don't feel a game based on exploration works well with procedural generation.. whats the point of having 18 Quintilian planets that no one will ever be able to visit and those they do visit they maybe explore a 5th of the planet? just seems like the whole redundancy of elite dangerous taking 100,000 pilots just under 25years to explore all the star systems.. just because you can make it that big doesn't mean you should. Having 300 planets that people want to explore 50% of the planet before moving onto new scenery would surely be better and still hold longevity.